Discover the comforts offered by Cotswolds Hotels, some of the finest luxury hotels and boutique hotels located in one of the most beautiful and preserved parts of England, UK. main Accommodation Home Page and click on the place you may want to stay at. Hotels in the Cotswolds tend to be full of 'old world charm' and very friendly and are a reflection of the beautiful rural surroundings of the Cotswold countryside. In your chosen hotel you can step back from the hum-drum existence of the rest of the world and settle into a more tranquil existence helped by the ambience and character of the Cotswolds where time has stood still for 300 years. 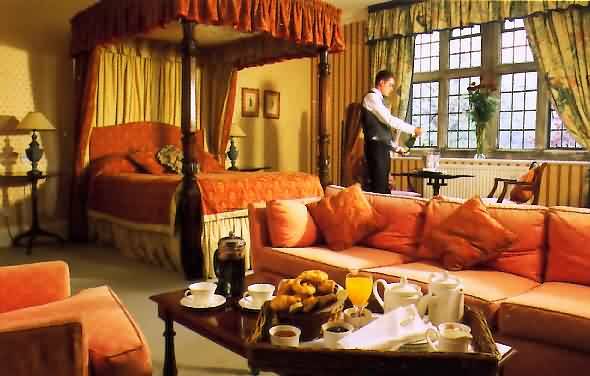 The hotels listed below are a selection hotels in the Cotswolds that we can recommend, most of which are officially rated and assessed, to give you unforgettable memories of your holiday vacation to one of the most beautiful and unique regions in England UK, if not the world. The hotel prices indicated are a guide and are based on two people sharing a room per night including breakfast. For more information about any of the Cotswold hotels listed simply click on the hotel name. Abbey Hotel Cheltenham £80.00 High quality bed & breakfast hotel in the centre of the attractive town of Cheltenham. Marlborough House Hotel Bath £95.00 Located close to the heart of Georgian Bath, and all the major attractions.